Arthur Hall announces his autumn schedule of dance classes for children and of classes for teens and adults. Students in Arthur Halls classes learn a movement technique which leads them into traditional African dances and songs, all accompanied by live drumming. One or more of the traditional dances learned in his classes may be performed in public. Camden resident Arthur Hall is a well known dancer, teacher, and choreographer. The Johnny Appleseed of Dance, he works nationally and internationally with people of all ages, bringing the joy of movement and dance into the lives of many thousands. Last year, he received a special award for excellence in arts education from the governor of New Hampshire. He is currently restaging his full-length ballet Fat Tuesday and all that jazz with Muntu Dance Theater of Chicago and Preservation Hall of New Orleans, a production which has received nine nominations for Black Theatre Alliance Awards, including one for Mr. Hall's choreography. Childrens classes will begin on Saturday, September 19 at Watts Hall in Thomaston at 11:00 a.m. All childrens classes meet from 11:00 a.m. to 12:00 p.m. and cost $7 per class. The Teen/Adult classes will begin on Wednesday, September 9, also at Watts Hall. Teen/Adult classes run from 7:00 to 8:30 p.m. and cost $10 per class. Pre-registration is appreciated, although drop-ins are welcome at all classes. For more information or to register, please call 548-2445. The complete current schedule of classes is also available on Arthur Hall's website at www.columbia.edu//Ileife. Arthur Hall announces the summer schedule of his Saturday Dance Academy, which runs from July 11 through August 29. Students in the Academy learn a movement technique which leads into learning traditional African dances and songs, all accompanied by live drumming. One or more of the traditional dances learned may be performed in public, perhaps as part of the next Camden Conference on Africa. 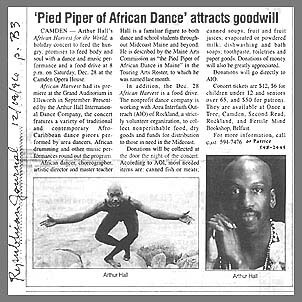 Arthur Hall is a well known dancer, teacher, and choreographer. Known as the Johnny Appleseed of dance, he works nationally and internationally with people of all ages, bringing the joy of movement and dance into the lives of many thousands. Last year, he received a special award for excellence in arts education from the governor of New Hampshire, and he is currently restaging his full-length ballet Fat Tuesday and all that jazz with Muntu Dance Theater of Chicago and Preservation Hall of New Orleans. Mr. Hall is a resident of Camden. When he is not available to conduct class himself, they may be taught by one of his protgs, Patrice Janssen or Emily Seymour. Saturday Dance Academy classes on July 11 and July 18 will be held in the Thompson Community Center in Union. The classes from July 25 through August 29 will be in Watts Hall in Thomaston. All classes meet from 10:00 to 11:00 a.m., and cost $7 per class or $48 for all eight classes. Drop-ins are welcome. For more information and to register, call 548-2445. The Maine Community Foundation has awarded a $500 grant to the Arthur Hall Dance Company. The grant was made from the Foundations Maine Christian Communications Arts Fund at the recommendation of Noel Paul Stookey, the Paul of Peter, Paul & Mary. "Im just done," said Arthur Hall when he received the grant, "especially since we didnt even ask for it. When you get this kind of recognition, you must be doing something right." What Arthur Hall did right most recently -- and what attracted the attention of Noel Paul Stookey -- was African Harvest for the World at the Grand Auditorium of Hancock County last month. Billed as "A Community Festival to Feed the Hungry," the full-length dance concert was a benefit for the Loaves and Fishes Food Pantry and the Emmaus Center of Ellsworth, Maine. "African Harvest is an idea we will take to towns across Maine," explained Arthur Hall. "The food collected helps feed the hungriest among us, and the music and dance helps feed the many souls hungry for this kind of cultural expression. The concerts show how vital the performing arts are to our communities." The next African Harvest is scheduled for December 28 at the Camden Opera House. The Opera House was packed to overflowing for last years Rhythm of Life concert to benefit the Arthur Hall International Dance Center, which will have open classes and rehearsals beginning in December in Watts Hall in Thomaston. The nonprofit Dance Center is working with the trustees of Watts Hall to install barres, a mirror wall, and sound baffles so regularly scheduled classes for all ages can begin next spring. "We have a conceptual home at the Farnsworth Museum in Rockland," Arthur Hall said, "but they dont have the space for classes. The Farnsworth suggested we look at Watts Hall, and I fell in love with it at first sight. With the continued support of the community and with recognition like we got from the Maine Community Foundation and Noel Paul Stookey, Watts Hall will soon be one of the finest dance spaces in the State of Maine." For up-to-date information on the Arthur Hall International Dance Center and African Harvest for the World dance concerts, see their web site at www.columbia.edu//Ileife. After sold-out dance concerts at the Rockport Opera House last summer and at the Camden Opera House last winter, Arthur Hall now has a home on the Internet. The new Web site is called Ile Ife and the Arthur Hall Collection. It is maintained by Bruce Williams, president of the nonprofit Ile Ife (pronounced EE-lay EE-fay) of Searsport. "We really didnt plan to make a home page," he says. "Three months ago I had never heard of HTML," the acronym for Hyper Text Markup Language, the code embedded in Internet documents. "The company needed a computer more powerful than our 1981 dinosaur, and at the same time we got a lot of encouragement from our stage manager Jim Williams, who was one of the original dancers for the People-to-People Dance Company in Camden. Jim is a computer specialist for Columbia University and had made a home page for Arthur there, so when the stuff we were feeding him began to get overwhelming, it just made more sense to learn how to make our own. Now we are linked back and forth to Columbia." The home page in Maine was first posted in March. It is presently composed of over a hundred files and is growing rapidly. Much of the material is about the history of the Arthur Hall Afro-American Dance Ensemble of Philadelphia between 1958 and 1988, the subject of a feature film being produced by Williams. "Many people locally recognize Arthur as the forefather of African dance in Maine," he says, "but not many know he has also been called the father of the black arts movement in Philadelphia. Its a rich and complex history. We are hoping the Web page will be both informative and a tool for collecting materials that are scattered across five continents." As one might expect, Ile Ife and the Arthur Hall Collection also contains background material on the nonprofit company of the same name, and it lists dance videos available from the Collection. These include Snake Dance Teacher Dance and The Well, which inaugurated the Second Sunday Film Series at The Farnsworth Art Museum in Rockland last month. "Searching the Internet for dance films," Williams reports, "I came across ArtWorks Videos in the American Dance Festivals catalog. After a few e-mails and a few phone calls, weve arranged to have our films listed in the ADF catalog next fall. "Its a small world," Williams continues. "Arthur has taught at ADF and for their Linkage Program in Africa and Asia. Joe Nash was one of Arthurs teachers back in the 50s, and he is perhaps the preeminent historian of black dance in America. He was in Orono last year on the ADF Humanities team for the Alvin Ailey concert at the Maine Center for the Arts. We recorded a lovely interview with Mr. Nash there, and he then donated years of material on Arthur to the Collection. That was really the beginning of the home page." Ile Ife and the Arthur Hall Collection has a page for Joe Nash, and the materials he donated are listed in a year-by-year chronology of the Afro-American Dance Ensemble. "Now we have links to ArtWorks and ADF Video," says Williams, "and Douglas Rosenberg, who runs them both will be teaching at the Bates Dance Festival this summer. It really is a small world, and the Internet somehow seems to make it smaller." There are also materials on West African mythology as it relates to Halls choreography and complete programs, including credits, for last summers Ile Ife Philadelphia Maine Memorial Dance Concerts and last winters Rhythm of Life Benefit Dance Concert. There are also reports on the proposed International Dance Center in Rockland, obituaries, press releases, and graphic and photograph files. "We need to add a section for the teachers and students where Arthur has residencies," says Williams. "Were talking to an artist in Camden about costume sketches so the kids arent running around at the last minute looking for strips of red and white cloth. The links to other Web sites should be expanded too. They will be in four major groups: African studies, dance, cultural resources in Philadelphia, and art links in Maine. Things have a tendency to overlap. Already we are talking about a page for Jobo Kunda of Hancock, who do African studies and Maine arts at the same time." Ile Ife and the Arthur Hall Collection can be found at http://IleIfe.org or by searching for "Arthur Hall," "Ile Ife," or sometimes even "African dance" with one or more of the Internet search engines.